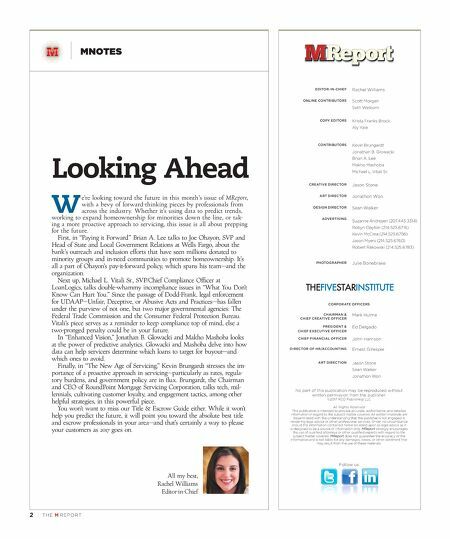 MNOTES W e're looking toward the future in this month's issue of MReport, with a bevy of forward-thinking pieces by professionals from across the industry. Whether it's using data to predict trends, working to expand homeownership for minorities down the line, or tak - ing a more proactive approach to servicing, this issue is all about prepping for the future. First, in "Paying it Forward" Brian A. Lee talks to Joe Ohayon, SVP and Head of State and Local Government Relations at Wells Fargo, about the bank's outreach and inclusion efforts that have seen millions donated to minority groups and in-need communities to promote homeownership. It's all a part of Ohayon's pay-it-forward policy, which spans his team—and the organization. Next up, Michael L. Vitali Sr., SVP/Chief Compliance Officer at LoanLogics, talks double-whammy incompliance issues in "What You Don't Know Can Hurt You." Since the passage of Dodd-Frank, legal enforcement for UDAAP—Unfair, Deceptive, or Abusive Acts and Practices—has fallen under the purview of not one, but two major governmental agencies: The Federal Trade Commission and the Consumer Federal Protection Bureau. Vitali's piece serves as a reminder to keep compliance top of mind, else a two-pronged penalty could be in your future. In "Enhanced Vision," Jonathan B. Glowacki and Makho Mashoba looks at the power of predictive analytics. Glowacki and Mashoba delve into how data can help servicers determine which loans to target for buyout—and which ones to avoid. Finally, in "The New Age of Servicing," Kevin Brungardt stresses the im- portance of a proactive approach in servicing—particularly as rates, regula- tory burdens, and government policy are in flux. Brungardt, the Chairman and CEO of RoundPoint Mortgage Servicing Corporation, talks tech, mil- lennials, cultivating customer loyalty, and engagement tactics, among other helpful strategies, in this powerful piece. You won't want to miss our Title & Escrow Guide either. While it won't help you predict the future, it will point you toward the absolute best title and escrow professionals in your area—and that's certainly a way to please your customers as 2017 goes on. All my best, Rachel Williams Editor-in-Chief 2 | TH E M R EP O RT EDITOR-IN-CHIEF Rachel Williams ONLINE CONTRIBUTORS Scott Morgan Seth Welborn COPY EDITORS Krista Franks Brock Aly Yale CONTRIBUTORS Kevin Brungardt Jonathan B. Glowacki Brian A. Lee Makho Mashoba Michael L. Vitali Sr. CREATIVE DIRECTOR Jason Stone ART DIRECTOR Jonathon Won DESIGN DIRECTOR Sean Walker ADVERTISING Suzanne Andresen (207.443.3314) Robyn Clayton (214.525.6716) Kevin McCrea (214.525.6756) Jason Myers (214.525.6760) Robert Rakowski (214.525.6783) PHOTOGRAPHER Julie Bonebrake CORPORATE OFFICERS CHAIRMAN & CHIEF CREATIVE OFFICER Mark Hulme PRESIDENT & CHIEF EXECUTIVE OFFICER Ed Delgado CHIEF FINANCIAL OFFICER John Harrison DIRECTOR OF HR/ACCOUNTING Ernest Gillespie ART DIRECTION Jason Stone Sean Walker Jonathon Won No part of this publication may be reproduced without written permission from the publisher. ©2017 REO Publishing LLC All Rights Reserved This publication is intended to provide accurate, authoritative, and detailed information in regard to the subject matter covered. All written materials are disseminated with the understanding that the publisher is not engaged in rendering legal advice or other professional services. Under no circumstance should the information contained herein be relied upon as legal advice as it is designed to be a source of information only. MReport strongly encourages the use of qualified attorneys or other qualified experts with regard to the subject matter covered. MReport does not guarantee the accuracy of the information and is not liable for any damages, losses, or other detriment that may result from the use of these materials. 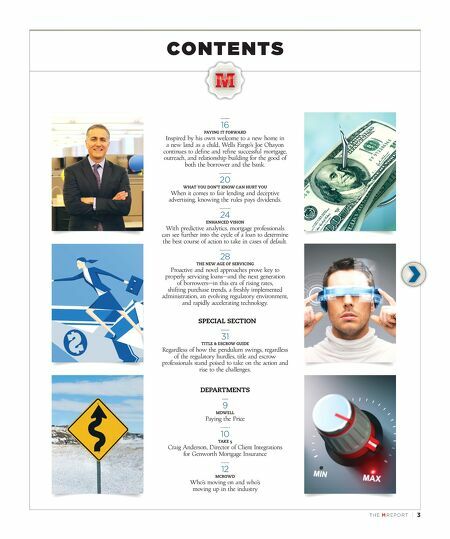 Looking Ahead © 2011 First American Financial Corporation and/or its affiliates. All rights reserved. YOUR business is OUR business! First American Mortgage Services is laser focused on mitigating YOUR cost, risk and exposure by aligning our advanced solutions with YOUR strategic objectives and compliance needs. We are the New First American, over 120 years young, strong and financially secure. Insight | Innovation | Integrity First American Title Insurance Company and First American Mortgage Services make no express or implied warranty respecting the information presented and assume no responsibility for errors or omissions. FIRST AMERICAN and FIRST AMERICAN TITLE are trademarks owned by First American Financial Corporation. 2 | Th e M Rep o RT Publisher Jon Ball contributing editor Abby Gregory online editor theMrePort.coM Ryan Schuette coPy editors Alison Rich emily White Youree heather hill contributors phil Britt Bob Calandra eric Fox Jack Konyk Mark Lieberman creative director Jason Stone art director Jonathan Won associate art directors Bruce Sons Chanyanont Loha-Unchit design director Sean Walker advertising Dina Duncan (214.525.6740) Jason Myers (214.525.6760) Andi Zimmerman (214.525.6724) technology Toby Tull Brandon Shangraw social Media Leon McKenzie Ani Vera circulation/corresPondence Celina Avila corPorate officers chairMan & chief creative officer chief executive officer Mark hulme edward R. Delgado business develoPMent Andi Zimmerman chief financial officer John harrison director of huMan resources ernest Gillespie director of oPerations Toby Tull account executives senior account executive Donna Lott (214.525.6792) sPonsorshiPs Jason Myers (214.525.6760) account executives Renee Charles (214.525.6742) Thomas Griffin (214.525.6754) Kristin Larson (214.525.6713) Ryan McLemore (214.525.6706) Marketing Travis Bogdon Matt hulme Production Kyle Curtis Miguel Martinez Christian McCrossan concierge Celina Avila art direction Jason Stone Sean Walker Jonathan Won No part of this publication may be reproduced without written permission from the publisher. ©2011 Reo publishing LLC All Rights Reserved This publication is intended to provide accurate, authoritative, and detailed information in regard to the subject matter covered. All written materials are disseminated with the understanding that the publisher is not engaged in rendering legal advice or other professional services. Under no circumstance should the information contained herein be relied upon as legal advice as it is designed to be a source of information only. MReport strongly encourages the use of qualified attorneys or other qualified experts with regard to the subject matter covered. MReport does not guarantee the accuracy of the information and is not liable for any damages, losses, or other detriment that may result from the use of these materials. FORDEFAULTSERVICINGPROFESSIONALS THEFIVESTARINSTITUTE Follow us.